Rev. 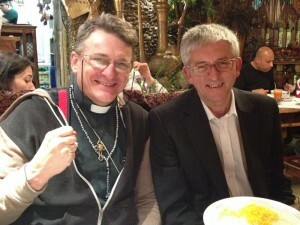 Stephen Sizer is a great guy. Our little group of peace pilgrims left Damascus early on April 15. We drove to Beirut and then flew to London via Frankfurt, arriving at around midnight with no idea of exactly where we were staying! Who took it upon himself to borrow the church mini-bus and scoot out to Heathrow in the middle of the night and then go scouring London for the location of the Catholic Worker’s house of hospitality? Stephen Sizer! Sometimes actions speak far louder than words. In this case though we’ll let Stephen’s words do the talking. He was interviewed by George Galloway on ‘Sputnik’ on the same day John Shipton and I were (see our interview on Syria here). It was a great day. It was our first morning in London, which meant Stephen had had even less sleep than we had (having spent an hour in the car getting home after dropping us)! Even so, it was a memorable day and this was a great interview, particularly for any who might still think that unquestioning support for the State of Israel is somehow obligatory for all Christians. Tags: christian zionism, father dave, israel, John Shipton, London, stephen sizer. Filed under israel and palestine religious conflict by Father Dave on May 6th, 2014.